Although the United States was actively involved in World War I for only nineteen months, from April 1917 to November 1918, the mobilization of the economy was extraordinary. (See the chronology at the end for key dates). Over four million Americans served in the armed forces, and the U.S. economy turned out a vast supply of raw materials and munitions. The war in Europe, of course, began long before the United States entered. On June 28, 1914 in Sarajevo Gavrilo Princip, a young Serbian revolutionary, shot and killed Austrian Archduke Franz Ferdinand and his wife Sophie. A few months later the great powers of Europe were at war. Once the war began, however, it became clear that Churchill was right. By the time the United States entered the war Americans knew that the price of victory would be high. What, then, impelled the United States to enter? What role did economic forces play? One factor was simply that Americans generally – some ethnic minorities were exceptions – felt stronger ties to Britain and France than to Germany and Austria. By 1917 it was clear that Britain and France were nearing exhaustion, and there was considerable sentiment in the United States for saving our traditional allies. The insistence of the United States on her trading rights was also important. Soon after the war began Britain, France, and their allies set up a naval blockade of Germany and Austria. Even food was contraband. The Wilson Administration complained bitterly that the blockade violated international law. U.S. firms took to using European neutrals, such as Sweden, as intermediaries. Surely, the Americans argued, international law protected the right of one neutral to trade with another. Britain and France responded by extending the blockade to include the Baltic neutrals. The situation was similar to the difficulties the United States experienced during the Napoleonic wars, which drove the United States into a quasi-war against France, and to war against Britain. Ultimately, however, it was not the conventional surface vessels used by Britain and France to enforce its blockade that enraged American opinion, but rather submarines used by Germany. When the British (who provided most of the blockading ships) intercepted an American ship, the ship was escorted into a British port, the crew was well treated, and there was a chance of damage payments if it turned out that the interception was a mistake. The situation was very different when the Germans turned to submarine warfare. German submarines attacked without warning, and passengers had little chance of to save themselves. To many Americans this was a brutal violation of the laws of war. The Germans felt they had to use submarines because their surface fleet was too small to defeat the British navy let alone establish an effective counter-blockade. The first submarine attack to inflame American opinion was the sinking of the Lusitania in May 1915. The Lusitania left New York with a cargo of passengers and freight, including war goods. When the ship was sunk over 1150 passengers were lost including 115 Americans. In the months that followed further sinkings brought more angry warnings from President Wilson. For a time the Germans gave way and agreed to warn American ships before sinking them and to save their passengers. In February 1917, however, the Germans renewed unrestricted submarine warfare in an attempt to starve Britain into submission. The loss of several U.S. ships was a key factor in President Wilson’s decision to break diplomatic relations with Germany and to seek a declaration of war. From a crude dollar-and-cents point of view it is hard to justify the war based on the trade lost to the United States. U.S. exports to Europe rose from $1.479 billion dollars in 1913 to $4.062 billion in 1917. Suppose that the United States had stayed out of the war, and that as a result all trade with Europe was cut off. Suppose further, that the resources that would have been used to produce exports for Europe were able to produce only half as much value when reallocated to other purposes such as producing goods for the domestic market or exports for non-European countries. Then the loss of output in 1917 would have been $2.031 billion per year. This was about 3.7 percent of GNP in 1917, and only about 6.3 percent of the total U.S. cost of the war. On March 21, 1918 the Germans launched a massive offensive on the Somme battlefield and successfully broke through the Allied lines. In May and early June, after U.S. entry into the war, the Germans followed up with fresh attacks that brought them within fifty miles of Paris. Although a small number of Americans participated it was mainly the old war: the Germans against the British and the French. The arrival of large numbers of Americans, however, rapidly changed the course of the war. The turning point was the Second Battle of the Marne fought between July 18 and August 6. The Allies, bolstered by significant numbers of Americans, halted the German offensive. The initiative now passed to the Allies. They drove the Germans back in a series of attacks in which American troops played an increasingly important role. The first distinctively American offensive was the battle of the St. Mihiel Salient fought from September 12 to September 16, 1918; over half a million U.S. troops participated. The last major offensive of the war, the Meuse-Argonne offensive, was launched on September 26, with British, French, and American forces attacking the Germans on a broad front. The Germans now realized that their military situation was deteriorating rapidly, and that they would have to agree to end to the fighting. The Armistice occurred on November 11, 1918 – at the eleventh hour, of the eleventh day, of the eleventh month. The first and most important mobilization decision was the size of the army. When the United States entered the war, the army stood at 200,000, hardly enough to have a decisive impact in Europe. However, on May 18, 1917 a draft was imposed and the numbers were increased rapidly. Initially, the expectation was that the United States would mobilize an army of one million. The number, however, would go much higher. Overall some 4,791,172 Americans would serve in World War I. Some 2,084,000 would reach France, and 1,390,000 would see active combat. Once the size of the Army had been determined, the demands on the economy became obvious, although the means to satisfy them did not: food and clothing, guns and ammunition, places to train, and the means of transport. The Navy also had to be expanded to protect American shipping and the troop transports. Contracts immediately began flowing from the Army and Navy to the private sector. The result, of course, was a rapid increase in federal spending from $477 million in 1916 to a peak of $8,450 million in 1918. (See Table 1 below for this and other data on the war effort.) The latter figure amounted to over 12 percent of GNP, and that amount excludes spending by other wartime agencies and spending by allies, much of which was financed by U.S. loans. 1. Miron and Romer (1990, table 2). 2-3. U.S. Bureau of the Census (1975), series Y352 and Y457. 4. U.S. Bureau of the Census (1975), series Y458 and Y459. The estimates are the average for fiscal year t and fiscal year t+1. 5. Friedman and Schwartz (1970, table 1, June dates). 6-8. Balke and Gordon (1989, table 10, pp. 84-85).The original series were in 1982 dollars. 9. U.S. Bureau of the Census (1975), series D740. 10-11. Kendrick (1961, table A-VI, p. 306; table A-X, p. 312). Although the Army would number in the millions, raising these numbers did not prove to be an unmanageable burden for the U.S economy. The total labor force rose from about 40 million in 1916 to 44 million in 1918. This increase allowed the United States to field a large military while still increasing the labor force in the nonfarm private sector from 27.8 million in 1916 to 28.6 million in 1918. Real wages rose in the industrial sector during the war, perhaps by six or seven percent, and this increase combined with the ease of finding work was sufficient to draw many additional workers into the labor force. Many of the men drafted into the armed forces were leaving school and would have been entering the labor force for the first time in any case. The farm labor force did drop slightly from 10.5 million in 1916 to 10.3 million workers in 1918, but farming included many low-productivity workers and farm output on the whole was sustained. Indeed, the all-important category of food grains showed strong increases in 1918 and 1919. Figure 1 shows production of steel ingots and “total industrial production” – an index of steel, copper, rubber, petroleum, and so on – monthly from January 1914 through 1920. It is evident that the United States built up its capacity to turn out these basic raw materials during the years of U.S. neutrality when Britain and France were its buying supplies and the United States was beginning its own tentative build up. The United States then simply maintained the output of these materials during the years of active U.S. involvement and concentrated on turning these materials into munitions. Prices on the New York Stock Exchange, shown in Figure 2, provide some insight into what investors thought about the strength of the economy during the war era. The upper line shows the Standard and Poor’s/Cowles Commission Index. The lower line shows the “real” price of stocks – the nominal index divided by the consumer price index. When the war broke out the New York Stock Exchange was closed to prevent panic selling. There are no prices for the New York Stock Exchange, although a lively “curb market” did develop. After the market reopened it rose as investors realized that the United States would profit as a neutral. The market then began a long slide that began when tensions between the United States and Germany rose at the end of 1916 and continued after the United States entered the war. A second, less rise began in the spring of 1918 when an Allied victory began to seem possible. The increase continued and gathered momentum after the Armistice. In real terms, however, as shown by the lower line in the figure, the rise in the stock market was not sufficient to offset the rise in consumer prices. At times one hears that war is good for the stock market, but the figures for World War I, as the figures for other wars, tell a more complex story. Table 2 shows the amounts of some of the key munitions produced during the war. During and after the war critics complained that the mobilization was too slow. American troops, for example, often went into battle with French artillery, clearly evidence, the critics implied, of incompetence somewhere in the supply chain. It does take time, however, to convert existing factories or build new ones and to work out the details of the production and distribution process. The last column of Table 2 shows peak monthly production, usually October 1918, at an annual rate. It is obvious that by the end of the war the United States was beginning to achieve the “production miracle” that occurred in World War II. When Franklin Roosevelt called for 50,000 planes in World War II, his demand was seen as an astounding exercise in bravado. Yet when we look at the last column of the table we see that the United States was hitting this level of production for Liberty engines by the end World War I. There were efforts during the war to coordinate Allied production. To some extent this was tried – the United States produced much of the smokeless powder used by the Allies – but it was always clear that the United States wanted its own army equipped with its own munitions. Smokeless powder (pounds) 632,504,000 n.a. Where did the money come from to buy all these munitions? Then as now there were, the experts agreed, three basic ways to raise the money: (1) raising taxes, (2) borrowing from the public, and (3) printing money. In the Civil War the government had had simply printed the famous greenbacks. In World War I it was possible to “print money” in a more roundabout way. The government could sell a bond to the newly created Federal Reserve. The Federal Reserve would pay for it by creating a deposit account for the government, which the government could then draw upon to pay its expenses. If the government first sold the bond to the general public, the process of money creation would be even more roundabout. In the end the result would be much the same as if the government had simply printed greenbacks: the government would be paying for the war with newly created money. The experts gave little consideration to printing money. The reason may be that the gold standard was sacrosanct. A financial policy that would cause inflation and drive the United States off the gold standard was not to be taken seriously. Some economists may have known the history of the greenbacks of the Civil War and the inflation they had caused. The real choice appeared to be between raising taxes and borrowing from the public. Most economists of the World War I era believed that raising taxes was best. Here they were following a tradition that stretched back to Adam Smith who argued that it was necessary to raise taxes in order to communicate the true cost of war to the public. During the war Oliver Morton Sprague, one of the leading economists of the day, offered another reason for avoiding borrowing. It was unfair, Sprague argued, to draft men into the armed forces and then expect them to come home and pay higher taxes to fund the interest and principal on war bonds. Most men of affairs, however, thought that some balance would have to be struck between taxes and borrowing. Treasury Secretary William Gibbs McAdoo thought that financing about 50 percent from taxes and 50 percent from bonds would be about right. Financing more from taxes, especially progressive taxes, would frighten the wealthier classes and undermine their support for the war. In October 1917 Congress responded to the call for higher taxes with the War Revenue Act. This act increased the personal and corporate income tax rates and established new excise, excess-profit, and luxury taxes. The tax rate for an income of $10,000 with four exemptions (about $140,000 in 2003 dollars) went from 1.2 percent in 1916 to 7.8 percent. For incomes of $1,000,000 the rate went from 10.3 percent in 1916 to 70.3 percent in 1918. These increase in taxes and the increase in nominal income raised revenues from $930 million in 1916 to $4,388 million in 1918. Federal expenditures, however, increased from $1,333 million in 1916 to $15,585 million in 1918. A huge gap had opened up that would have to be closed by borrowing. Short-term borrowing was undertaken as a stopgap. To reduce the pressure on the Treasury and the danger of a surge in short-term rates, however, it was necessary to issue long-term bonds, so the Treasury created the famous Liberty Bonds. The first issue was a thirty-year bond bearing a 3.5% coupon callable after fifteen years. There were three subsequent issues of Liberty Bonds, and one of shorter-term Victory Bonds after the Armistice. In all, the sale of these bonds raised over $20 billion dollars for the war effort. In order to strengthen the market for Liberty Bonds, Secretary McAdoo launched a series of nationwide campaigns. Huge rallies were held in which famous actors, such as Charlie Chaplin, urged the crowds to buy Liberty Bonds. The government also enlisted famous artists to draw posters urging people to purchase the bonds. One of these posters, which are widely sought by collectors, is shown below. Louis Raemaekers. 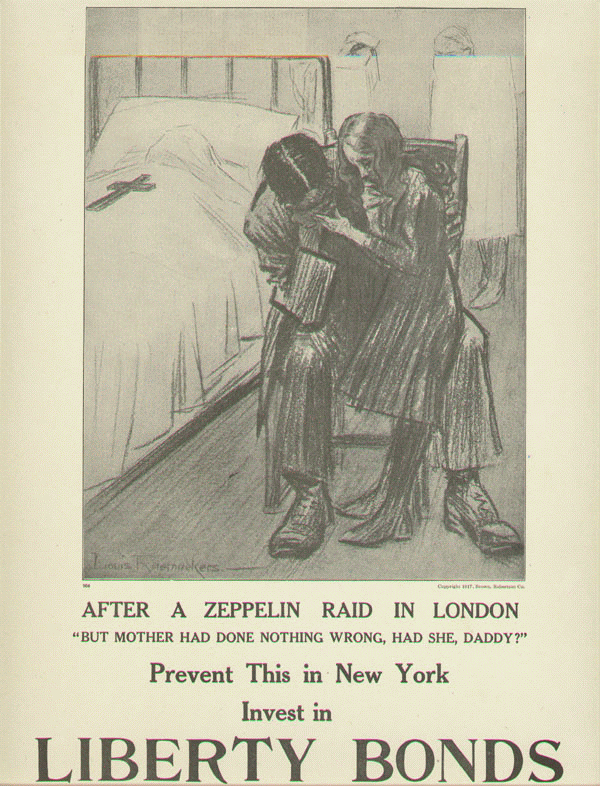 After a Zeppelin Raid in London: “But Mother Had Done Nothing Wrong, Had She, Daddy?” Prevent this in New York: Invest in Liberty Bonds. 19″ x 12.” From the Rutgers University Library Collection of Liberty Bond Posters. Although the campaigns may have improved the morale of both the armed forces and the people at home, how much the campaigns contributed to expanding the market for the bonds is an open question. The bonds were tax-exempt – the exact degree of exemption varied from issue to issue – and this undoubtedly made them attractive to investors in high tax brackets. Indeed, the Treasury was criticized for imposing high marginal taxes with one hand, and then creating a loophole with the other. The Federal Reserve also bought many of the bonds creating new money. Some of this new “highpowered money” augmented the reserves of the commercial banks which allowed them to buy bonds or to finance their purchase by private citizens. Thus, directly or indirectly, a good deal of the support for the bond market was the result of money creation rather than savings by the general public. Table 3 provides a rough breakdown of the means used to finance the war. Of the total cost of the war, about 22 percent was financed by taxes and from 20 to 25 percent by printing money, which meant that from 53 to 58 percent was financed through the bond issues. Note: Direct money creation is the increase in the stock of high-powered money net of the increase in monetary gold. Indirect money creation is the increase in monetary liabilities not matched by the increase in high-powered money. Heavy reliance on the Federal Reserve meant, of course, that the stock of money increased rapidly. As shown in Table 1, the stock of money rose from $20.7 billion in 1916 to $35.1 billion in 1920, about 70 percent. The price level (GDP deflator) increased 85 percent over the same period. Once the contracts for munitions were issued and the money began flowing, the government might have relied on the price system to allocate resources. This was the policy followed during the Civil War. For a number of reasons, however, the government attempted to manage the allocation of resources from Washington. For one thing, the Wilson administration, reflecting the Progressive wing of the Democratic Party, was suspicious of the market, and doubted its ability to work quickly and efficiently, and to protect the average person against profiteering. Another factor was simply that the European belligerents had adopted wide-ranging economic controls and it made sense for the United States, a latecomer, to follow suit. A wide variety of agencies were created to control the economy during the mobilization. A look at four of the most important – (1) the Food Administration, (2) the Fuel Administration, (3) the Railroad Administration, and (4) the War Industries Board – will suggest the extent to which the United States turned away from its traditional reliance on the market. Unfortunately, space precludes a review of many of the other agencies such as the War Shipping Board, which built noncombatant ships, the War Labor Board, which attempted to settle labor disputes, and the New Issues Committee, which vetted private issues of stocks and bonds. The Food Administration was created by the Lever Food and Fuel Act in August 1917. Herbert Hoover, who had already won international fame as a relief administrator in China and Europe, was appointed to head it. The mission of the Food Administration was to stimulate the production of food and assure a fair distribution among American civilians, the armed forces, and the Allies, and at a fair price. The Food Administration did not attempt to set maximum prices at retail or (with the exception of sugar) to ration food. The Act itself set what then was a high minimum price for wheat – the key grain in international markets – at the farm gate, although the price would eventually go higher. The markups of processors and distributors were controlled by licensing them and threatening to take their licenses away if they did not cooperate. The Food Administration then attempted control prices and quantities at retail through calls for voluntary cooperation. Millers were encouraged to tie the sale of wheat flour to the sale of less desirable flours – corn meal, potato flour, and so on – thus making a virtue out of a practice that would have been regarded as a disreputable evasion of formal price ceilings. Bakers were encouraged to bake “Victory bread,” which included a wheat-flour substitute. Finally, Hoover urged Americans to curtail their consumption of the most valuable foodstuffs: there were, for example, Meatless Mondays and Wheatless Wednesdays. The Fuel Administration was created under the same Act as the Food Administration. Harry Garfield, the son of President James Garfield, and the President of Williams College, was appointed to head it. Its main problem was controlling the price and distribution of bituminous coal. In the winter of 1918 a variety of factors combined to cause a severe coal shortage that forced school and factory closures. The Fuel Administration set the price of coal at the mines and the margins of dealers, mediated disputes in the coalfields, and worked with the Railroad Administration (described below) to reduce long hauls of coal. The Wilson Administration nationalized the railroads and put them under the control of the Railroad Administration in December of 1917, in response to severe congestion in the railway network that was holding up the movement of war goods and coal. Wilson’s energetic Secretary of the Treasury (and son-in-law), William Gibbs McAdoo, was appointed to head it. The railroads would remain under government control for another 26 months. There has been considerable controversy over how well the system worked under federal control. Defenders of the takeover point out that the congestion was relieved and that policies that increased standardization and eliminated unnecessary competition were put in place. Critics of the takeover point to the large deficit that was incurred, nearly $1.7 billion, and to the deterioration of the capital stock of the industry. William J. Cunningham’s (1921) two papers in the Quarterly Journal of Economics, although written shortly after the event, still provide one of the most detailed and fair-minded treatments of the Railroad Administration. The most important federal agency, at least in terms of the scope of its mission, was the War Industries Board. The Board was established in July of 1917. Its purpose was no less than to assure the full mobilization of the nation’s resources for the purpose of winning the war. Initially the Board relied on persuasion to make its orders effective, but rising criticism of the pace of mobilization, and the problems with coal and transport in the winter of 1918, led to a strengthening of its role. In March 1918 the Board was reorganized, and Wilson placed Bernard Baruch, a Wall Street investor, in charge. Baruch installed a “priorities system” to determine the order in which contracts could be filled by manufacturers. Contracts rated AA by the War Industries Board had to be filled before contracts rated A, and so on. Although much hailed at the time, this system proved inadequate when tried in World War II. The War Industries Board also set prices of industrial products such as iron and steel, coke, rubber, and so on. This was handled by the Board’s independent Price Fixing Committee. It is tempting to look at these experiments for clues on how the economy would perform under various forms of economic control. It is important, however, to keep in mind that these were very brief experiments. When the war ended in November 1918 most of the agencies immediately wound up their activities. Only the Railroad Administration and the War Shipping Board continued to operate. The War Industries Board, for example, was in operation only for a total of sixteen months; Bernard Baruch’s tenure was only eight months. Obviously only limited conclusions can be drawn from these experiments. The human and economic costs of the war were substantial. The death rate was high: 48,909 members of the armed forces died in battle, and 63,523 died from disease. Many of those who died from disease, perhaps 40,000, died from pneumonia during the influenza-pneumonia epidemic that hit at the end of the war. Some 230,074 members of the armed forces suffered nonmortal wounds. John Maurice Clark provided what is still the most detailed and thoughtful estimate of the cost of the war; a total amount of about $32 billion. Clark tried to estimate what an economist would call the resource cost of the war. For that reason he included actual federal government spending on the Army and Navy, the amount of foreign obligations, and the difference between what government employees could earn in the private sector and what they actually earned. He excluded interest on the national debt and part of the subsidies paid to the Railroad Administration because he thought they were transfers. His estimate of $32 billion amounted to about 46 percent of GNP in 1918. The war left a number of economic legacies. Here we will briefly describe three of the most important. The finances of the federal government were permanently altered by the war. It is true that the tax increases put in place during the war were scaled back during the 1920s by successive Republican administrations. Tax rates, however, had to remain higher than before the war to pay for higher expenditures due mainly to interest on the national debt and veterans benefits. The international economic position of the United States was permanently altered by the war. The United States had long been a debtor country. The United States emerged from the war, however, as a net creditor. The turnaround was dramatic. In 1914 U.S investments abroad amounted to $5.0 billion, while total foreign investments in the United States amounted to $7.2 billion. Americans were net debtors to the tune of $2.2 billion. By 1919 U.S investments abroad had risen to $9.7 billion, while total foreign investments in the United States had fallen to $3.3 billion: Americans were net creditors to the tune of $6.4 billion. Before the war the center of the world capital market was London, and the Bank of England was the world’s most important financial institution; after the war leadership shifted to New York, and the role of the Federal Reserve was enhanced. The management of the war economy by a phalanx of Federal agencies persuaded many Americans that the government could play an important positive role in the economy. This lesson remained dormant during the 1920s, but came to life when the United States faced the Great Depression. Both the general idea of fighting the Depression by creating federal agencies and many of the specific agencies and programs reflected precedents set in Word War I. The Civilian Conservation Corps, a Depression era agency that hired young men to work on conservation projects, for example, attempted to achieve the benefits of military training in a civilian setting. The National Industrial Recovery Act reflected ideas Bernard Baruch developed at the War Industries Board, and the Agricultural Adjustment Administration hearkened back to the Food Administration. Ideas about the appropriate role of the federal government in the economy, in other words, may have been the most important economic legacy of American involvement in World War I.
June Archduke Franz Ferdinand is shot. August Beginning of the war. May Sinking of the Lusitania. War talk begins in the United States. February Germany renews unrestricted submarine warfare. Ayres, Leonard P. The War with Germany: A Statistical Summary. Washington DC: Government Printing Office. 1919. Balke, Nathan S. and Robert J. Gordon. “The Estimation of Prewar Gross National Product: Methodology and New Evidence.” Journal of Political Economy 97, no. 1 (1989): 38-92. Clark, John Maurice. “The Basis of War-Time Collectivism.” American Economic Review 7 (1917): 772-790. Clark, John Maurice. The Cost of the World War to the American People. New Haven: Yale University Press for the Carnegie Endowment for International Peace, 1931. Cuff, Robert D. The War Industries Board: Business-Government Relations during World War I. Baltimore: Johns Hopkins University Press, 1973. Cunningham, William J. “The Railroads under Government Operation. I: The Period to the Close of 1918.” Quarterly Journal of Economics 35, no. 2 (1921): 288-340. “II: From January 1, 1919, to March 1, 1920.” Quarterly Journal of Economics 36, no. 1. (1921): 30-71. Friedman, Milton, and Anna J. Schwartz. Monetary Statistics of the United States: Estimates, Sources, and Methods. New York: Columbia University Press, 1970. Kendrick, John W. Productivity Trends in the United States. Princeton: Princeton University Press, 1961. Koistinen, Paul A. C. Mobilizing for Modern War: The Political Economy of American Warfare, 1865-1919. Lawrence, KS: University Press of Kansas, 1997. Miron, Jeffrey A. and Christina D. Romer. “A New Monthly Index of Industrial Production, 1884-1940.” Journal of Economic History 50, no. 2 (1990): 321-37. Rockoff, Hugh. Drastic Measures: A History of Wage and Price Controls in the United States. New York: Cambridge University Press, 1984. Rockoff, Hugh. “Until It’s Over, Over There: The U.S. Economy in World War I.” National Bureau of Economic Research, Working Paper w10580, 2004. U.S. Bureau of the Census. Historical Statistics of the United States, Colonial Times to 1970, Bicentennial Edition. Washington, DC: Government Printing Office, 1975. Quoted in Gilbert (1994, 3). U.S. exports to Europe are from U.S. Bureau of the Census (1975), series U324. Real wages in manufacturing were computed by dividing “Hourly Earnings in Manufacturing Industries” by the Consumer Price Index (U.S. Bureau of the Census 1975, series D766 and E135). Steel ingots are from the National Bureau of Economic Research, macrohistory database, series m01135a, www.nber.org. Total Industrial Production is from Miron and Romer (1990), Table 2. The sharp and temporary drop in the winter of 1918 was due to a shortage of coal. The chart shows end-of-month values of the S&P/Cowles Composite Stock Index, from Global Financial Data: http://www.globalfinancialdata.com/. To get real prices I divided this index by monthly values of the United States Consumer Price Index for all items. This is available as series 04128 in the National Bureau of Economic Research Macro-Data Base available at http://www.nber.org/. U.S. investments abroad (U.S. Bureau of the Census 1975, series U26); Foreign investments in the U.S. (U.S.